A 3 time Club Angler of the Year, Ken is a dedicated fisherman, who came to the club with previous tournament experience. He joined 1st Bassmasters late in 2003, after fishing our Open tournament. 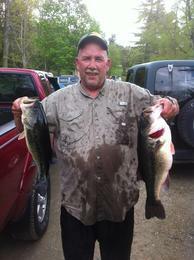 He didn't waste any time either, winning the first 2 events he fished. • 2006 - Top Ranked Angler - 38.08 Pts Ave.
• 2009- Top Ranked Angler - 47.50 Per Event Ave.